Basilic Milk Powder dispenser gives the flexibility for moms to carry only one, or may three serving of milk powder when going out with their love one. Mother can take up to four serving and can added up to another 4 serving for those who have twin babies or more than 1 babies still with bottle feeding. 4 compartments milk powder dispenser. Easy to dispense the milk powder - just remove the plug instead of removing the whole whole compartment. 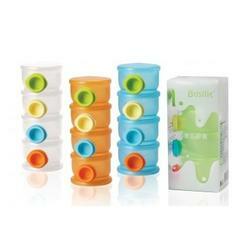 Made from PP Material - BPA Free.